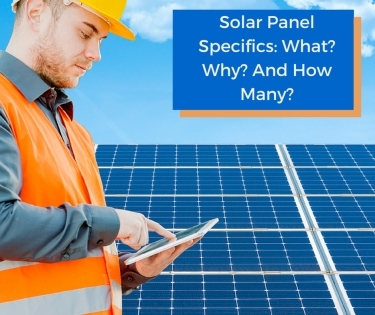 Before you make an investment in solar power, you should know the specifics. Here’s your guide to determining how much sun you’ll need to power your home. Solar panels are large, flat boards made up of interconnected photovoltaic cells. These small photovoltaic cells use conductive elements to generate electricity when they’re exposed to sunlight. Due to its relative availability, silicon is the most popular semiconductor used in solar cells. Monocrystalline silicon cells – Monocrystalline, or single-crystal silicon cells, are the most efficient photovoltaic cells on the market – and they’re also the most expensive. The extra efficiency may be worth the upcharge if you need lots of solar power but you don’t have much room on your roof. A few of these high-grade panels go a long way. Polycrystalline silicon cells – Since polycrystalline silicon cells are easily manufactured, they are significantly less expensive than their single-crystal relatives. However, these panels are less efficient and will take up more roof space. Thin film solar cells – Thin-film cells are less prevalent than pure silicon cells, but they’re gradually gaining popularity. They are manufactured by layering many thin strips of photovoltaic material (sometimes amorphous silicon) on top of one another. This thin film technology is flexible, easy to produce and can be aesthetically appealing, but the panels require a lot of space and may not be practical for residential rooftops. How much energy do you consume each month? How much energy you want your solar power system to produce? How much direct sunlight will your home get per day? Once you’ve determined your solar goals, you may have to adjust your expectations based on your budget, your climate and your roof . Since solar panels are made of different materials, each with unique efficiencies, it’s never safe to assume that all panels are equal. You can get a good estimate of how a certain solar panel performs based on its “power rating.” This numeric value indicates how many watts of electricity the panel should create in prime solar conditions. For reference, the average silicon solar panel produces about 200-250 watts of power in direct sunlight – the same amount of electricity could power 84 CFL bulbs for 1 hour. A kilowatt-hour (kWh) is a common unit for measuring home energy usage. A single kWh refers to 1 kilowatt (1,000 watts) of power produced in 1 hour. Most residential solar systems provide a range of power between 1 kWh and 5 kWh. A 1 kWh solar power system would need approximately five 200-watt solar panels to produce 1 kWh of energy per hour. Given that most homes get between 4-6 hours of direct sunlight per day, this system would produce about 5 kWh of power per day. The average U.S. household consumes 30 kWh of power per day, so this small system probably wouldn’t be able to power your whole home without significant cuts in energy consumption. A large 5 kWh system, which requires upward of 25 200-watt solar panels, can produce about 25 kWh of power per day. This system’s energy output is much closer to the national average, so if you have a large household, you’d probably be more comfortable with a solar power system of this . The exact number of solar panels you need will fluctuate depending on how much energy you plan to conserve, where you live and what type of panels you purchase.